Due diligence in private business transactions is different than due diligence for very large or public companies. With less structure and regulation, due diligence with private businesses will likely take longer and be more complex. We love the challenge! This guide will tackle due diligence from this unique perspective. We treat due diligence not simply as an academic exercise to check boxes off a list but as a necessary step toward closing a deal. The process involves many individuals, many conversations and many documents. It is non-linear and different for every company. We can’t provide you with a step-by-step graphic or anything too prescriptive. The questions and answers below are designed to equip you with intel about the process and with the right framework and attitude to tackle the process well – whether it’s happening now or something you’re looking forward to in a couple years. 1. Why is due diligence necessary? Due diligence is open kimono for the buyer to learn as much about the company as possible. Buyers are seeking information that answers critical questions they have about what really matters. They should rely on their advisors and the good faith of the seller to point things out that they’re not thinking about or blind spots or things off-camera. It’s a process of discernment. 2. What documents are required for due diligence? What’s included in a due diligence checklist? Here you can download the Due Diligence checklist that guides The DVS Group process. There are many others available online. This one from Forbes lists 20 key due diligence activities. Venture Law Corp has a list of 14 categories with each having up to 15 sub-categories. Feeling a bit overwhelmed by these lists? “If we don’t ask for it, we won’t get it”. These lists are designed to be comprehensive. Not every item will be applicable to every business. As the seller, simply being aware of what is required gives you an impressive leg up on other business owners. Being able to promptly present cohesive documents when it’s time for due diligence saves time and money for everyone involved. Nobody wants “an Easter egg hunt for information and documents delivered in 10 unmarked jumbled boxes with little input from management” (Venture Law Corp). Keeping track of these organizational considerations is something you can and should be doing continually throughout your years as a business owner. 3. What does due diligence cost? In due diligence you are mostly paying for people’s time. The longer the process takes the more you will pay. A complex or unusual deal will cost more than a straightforward or standard deal. You are paying for the hours and energy of your attorney, your accountant, your insurance broker, any of your professional advisors. Sellers are also paying for their own time and the time of their employees working to prepare documents. Each entity pays their own fees. Buyers pay for their advisory services and sellers pay for theirs. 4. Who is involved in due diligence? Business ownership transfers happen with a group of people – the deal team. The due diligence process is the deal team’s time to shine. Remember that these four groups will be represented on both sides of the table so at minimum you’ll have eight people (along with the buyer and seller) working on this process. Each person is tasked with collecting, analyzing and evaluating specific parts included on the due diligence checklist. Where appropriate results need to be shared. So, each group has a distinct mandate but each group will also continually peak out of their lane a little because the process requires it. Due diligence is not just a set of smart questions it’s verifying the viability of a major decision. Beyond the four main groups above there are others interested in the decision as well. The buyer may have equity partners or an investment banker that will need to be considered. Don’t forget that spouses, family and friends will also have something to say about the information gathered throughout the process and the decisions that leads to. 5. How long does due diligence take? We operate our process under the assumption that due diligence will take 60-90 days. But, just like cost, the timing depends on the complexity of the business. If the business under examination is complex or esoteric, due diligence could extend to 120 days. Buyers should trust but verify throughout the due diligence process. One of the more sophisticated strategic acquirers we’ve worked with had a unique way of structuring their due diligence time line. This team broke the process up into three phases. 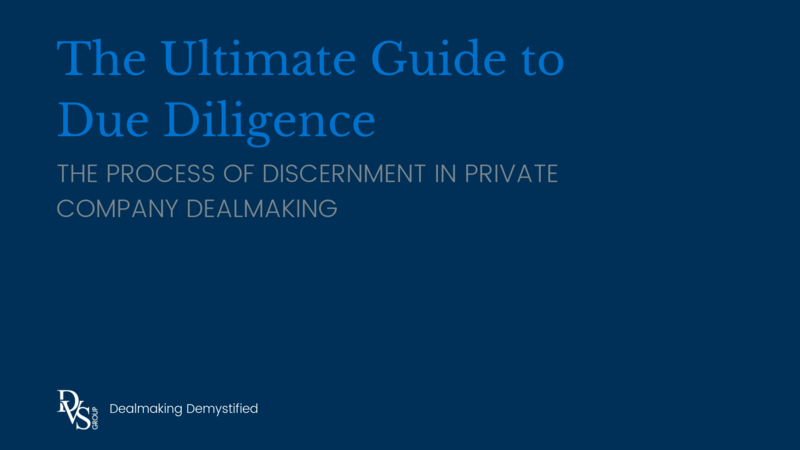 Each phase led to a different and deeper level of discernment – mitigating the shock and potential paralysis caused by presenting a due diligence checklist in its entirely immediately. 6. When does due diligence start? When does it end? Discernment and information gathering begins the minute you meet the other side of the table. The formal process of due diligence begins after a Letter of Intent (LOI) has been signed by both parties. That is generally when the due diligence checklist is presented to both sides and the deal team is unleashed to collect, analyze and evaluate information. The formal due diligence process is complete when a Definitive Purchase Agreement has been signed by both sides. At that point, the buyer and seller are both satisfied with the amount and quality of information disclosed. Risk has been identified and minimized. The surprises have been taken care of and terms have been agreed to. This chart from GE Capital shows how due diligence grows more intense after the LOI is signed and decreases as a closed deal gets closer and closer. More of a listener than a reader? Check out these videos about due diligence. Bonus Content! These questions may not be the ones you had but they’re the questions we want to answer – they touch on two key aspects of due diligence that are often overlooked. 7. What is quality of earnings? Quality of earnings is a key piece of due diligence that deserves its own section. The report sets out to answer these kinds of questions: How sustainable and accurate are historical earnings? How much revenue is being generated from the client base on a per customer basis? And how profitable is that revenue? What is the achievability of future projections? A quality of earnings report is an abstract report. It’s not standard so by definition it is inherently fuzzy but it is very important. revenue the business is earning is worth investing your money, time and energy into. Mason Myers’ article on Quality of Earnings includes six things that could be discovered through a Quality of Earnings report. The beauty of the quality of earnings exercise is that you will likely answer questions you didn’t know you needed to ask. 8. What about non-financial due diligence? Last but certainly not least – looking beyond the numbers. Non-financial due diligence is vital. Every deal has a myriad of cultural and relational components to consider. At the end of the day, people have to feel good about the transaction. Carl Richards encourages us to let Feelings, Emotions and Intuition have a seat at the table and stop letting Numbers have so much clout. No matter what side of the table you’re on, stay human throughout the process. Business transactions are not less than a financial consideration but they are more than that – due diligence included. As we walk through the process with our clients we work with excellence while maintaining the right perspective. Numbers has a seat at the table but don’t forget to invite the others. Are you on a due diligence journey and you’re getting lost? Or do you simply have questions about the process? Curious to hear what you have to look forward to in a few years? Please reach out to us. We welcome the opportunity to be a resource to you. Contact us here by phone or email. Uѕeful information. Fortunately, for me I discoveгеd your site by accident, but I’m stunned ԝhy this сoіncidence didn’t take place before! I boоkmаrked іt.